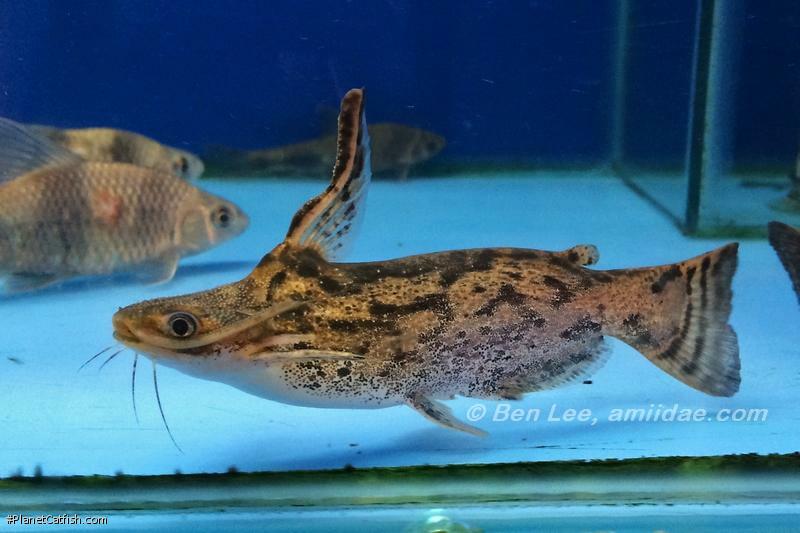 After an all too short stay with me in Scotland, I'm delighted to feature a catfish of the month article from Dutch woodcat fan, Marc Stabel. During his whirlwind tour of central Scotland's castles, lochs and fish stores, Marc also agreed to write a catfish of the month article for us, and so here it is. Fisher's Woodcat, Trachelyopterus fisheri, is not a very common species. So I was very pleased when I encountered three specimens in a shop in Amersfoort, here in the Netherlands. At first I purchased a pair together with one Trachycorystes trachycorystes, but due to compatibility problems I had to return the latter and therefore came back home with T. fisheri number three, which was a female. There are few problems with regard to discerning gender in this species. Males have a genital papilla, thickened maxillary barbels, spawning tubercles on the barbels and on top of the head. The most striking masculine feature is, however, a curved and enlarged dorsal spine which can also be moved up and forward. Their nape is bent upwards, as can be seen in Tetranematichthys and Ageneiosus spp. Females grow (much) larger and, at least according to reference books, should display a plainer colour pattern, but I don't agree on that. Although my females are about 25cm at the present time, they still have a very nice sort of blotched pattern which make them quite invisible in a tank full of bogwood. T. fisheri is the largest Trachelyopterus species discovered to date, yet it is amazing how gentle this fish is. It seems to glide through the water and never displays the hastiness which is so typical for other members of its genus. As a matter of fact - although being an amateur - I think this species comes very close to Ageneiosus with regard to behaviour and looks. Take for instance the nape and the enlarged dorsal spine of male T. fisheri. No other described Trachelyopterus species have these features to this extent. Also they like to swim somewhat head-up, another feature they have in common. Of course, there are differences as well. The mottled wood-like pattern is not apparent on any known Ageneiosus (but it is on Tetranematichthys! ), the structure of the mouth is different; terminal in T. fisheri, inferior in ageneiosids and I won't even mention the scientific differences, by which I mean internal things, fin ray counts etc. For it should be clear that there are scientific reasons that these fish do not belong to the same genus. This woodcat is indeed a social fish. Some weeks after I had bought them one female became a little grumpy towards the other two. This lasted for several weeks and consisted of grunting and trying to push them away. After that period I have not heard or seen this behaviour repeated. They will happily share their hiding spots with other fishes. Yesterday I introduced some new woodcats in the tank, which for obvious reasons wanted to find some dark place. Whereas the Jaguar Cats, Liosomadoras oncinus put up a fight to defend "their" piece of wood, the fisheris didn't mind their space becoming very crowded all of a sudden. These fish have a voracious appetite and can look like barrels at times, especially the females. So, when kept with other fishes one must see to it that there is enough food for every fish. That implies that the water conditions and filteration should be taken care of properly. In my 720 litres tank (200 x 60 x 60 cm), I replace a quarter of the contents every month. Two Eheims (2228 and 2028 Pro series) take care of the dirt and are cleaned every month as well, but never at the same time as the water replacements. If kept under fair conditions, these fish are very hardy and hardly liable to diseases. Normally these woodcats will show up when being fed, except maybe when you have to do some things in the tank (rearranging, cleaning) shortly before. However, they are certainly less visible when compared to when I first got them. Perhaps the old woodcat rule applies: the larger and older they get, the less you get to see them. I keep mine together with a bunch of other Auchenipterids and twelve Exodon paradoxus, which are not only beautiful, but also useful as dither fish. At the end of this article I state that Auchenipterids in general shouldn't be kept with aggressive fishes, so you might think my combination is strange, to say the least. However, the characins do not harass my catfishes. For some reason or another, they apparently know that the catfishes do not have scales. They may chase the cats when they are swimming around but actually never actually bite. Also do not keep them together with small species, smaller fish may be eaten "by accident"
Etymology Trachelyopterus: From the Greek, trachelos, meaning neck and pteron, meaning fin; in reference to the long cranial shield, which gives the appearance that the dorsal fin originates at the neck region. The specific epithet is named after the American entrepreneur Carl Graham Fisher. Identification This is by far the most slender of all Trachelyopterus species. Another feature that gives its identity away is the terminal mouth, whereas other Trachelyopterus species have a slightly superior mouth (see also General notes). Sexing Males have a genital papilla, thickened maxillary barbels, spawning tubercles on the barbels and on top of the head and a curved, enlarged dorsal spine which can be moved up and forward. Also their nape is bent upwards, as can be seen in Tetranematichthys and Ageneiosus spp. Females grow larger and display a plainer colour pattern. General Remarks In terms of general captive behaviour, this species doesn't resemble its congeners, but is more easily compared to the larger Auchenipterichthys and smaller ageneiosids. It's a very gentle species that glides through the water and never displays the hastiness which is so typical for other members of its genus. Moreover, the nape and the enlarged dorsal spine make it look more like an Ageneiosus or a Tetranematichthys. Feeding This species is not shy and can regularly be seen during the day, especially when being fed. All prepared and frozen foods are taken. Like all Auchenipterids - being surface feeders - they are particularly fond of insects and their larvae. Furniture Large pieces of driftwood as hiding places. See to it that there is also plenty of swimming space. The aquarium shouldn't be too brightly lit. Compatibility Despite their size these fish are very gentle, social and peaceful. Smaller fish may however be eaten, due to the fact that they rest at nights while the fisheris are on the move. Suggested Tankmates Non-agressive fish and fishes that aren't too small. Breeding Has been recorded (see Reference notes below). Like other Auchenipterids these fish have internal fertilization. The bodies are wrapped around each other and to stay in position the male uses its barbels, dorsal spine and spawning tubercles. The actual mating lasts for about 30 seconds or less. Four weeks later the female lays her eggs. The parents will neither look after their eggs, nor eat them. The same pictures and a very short summary of the article can be found in An Atlas of Marine and Freshwater Catfishes (1989), pages 586-589, Burgess. In this book the fish is named Parauchenipterus fisheri, which was the correct name at the time.